Welcome to the Biggest KScope Conference Ever! 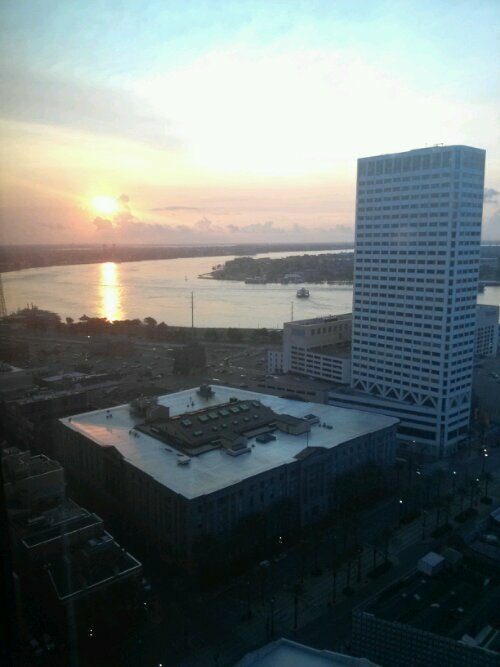 Day one at ODTUG’s KScope13 was awesome as always with a great set of symposiums and networking events. 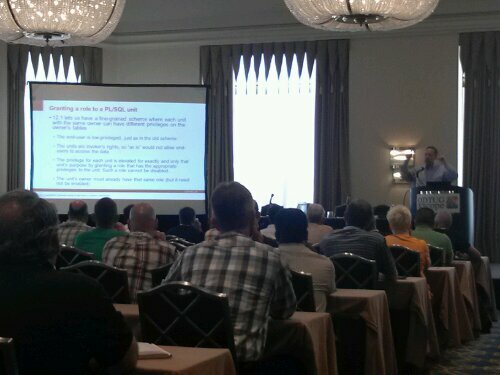 At the speaker meeting we learned that there are 1,400 registered attendees, 30 countries represented and over 50 exhibitors making this the largest event and largest exhibit hall in the history of the Oracle Development Tools User Group (ODTUG). So we must be doing something right to attract such a large crowd. Part of what we do right is getting the top Oracle developers, consultants, and Oracle ACEs in the world to present. And we get stellar participation from the Product Management and Development teams at Oracle Corporation. Even though it was Sunday, there was a tremendous turnout for our free Sunday Symposiums. In the Symposiums we had rooms dedicated to specific topics so attendees could stay in one place all day and get a series of related talks. After conducting my now annual Morning Chi Gung class (had nine attendees!) I spent the day in the DB & Developer’s Toolbox Symposium. It had quite a line up. 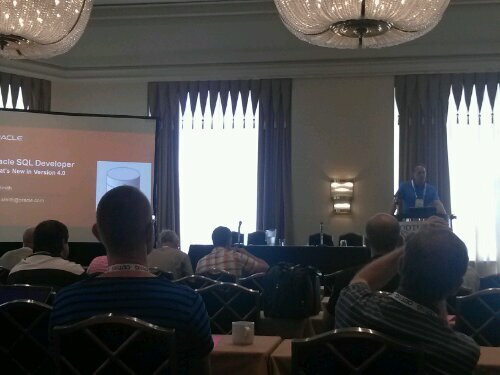 First I attended Jeff Smith’s session on SQL Developer 4.0 which will come out later this summer. Got lots of great tips and trick which I am sure Jeff will be blogging about at ThatJeffSmith.com in the near future. Next was Oracle Technologist Tom Kyte who spoke about many new features and enhancements to SQL And PL/SQL in the upcoming Oracle 12c release of the database. 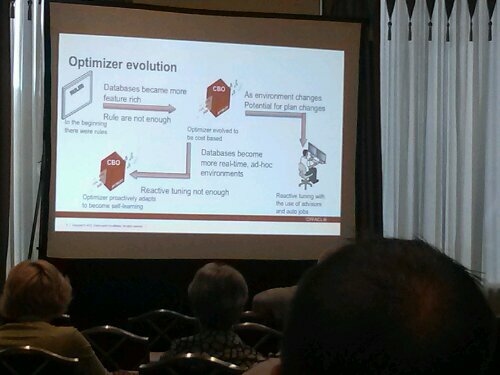 And last for my day of learning was Maria Colgan discussing changes to the Oracle Optimizer in 12c. As always, Maria provided so much information my head was ready to explode from information overload. And later in the week she has a second session on this topic with even more new features to discuss. If every Oracle DBA could attend one of her sessions, all of our databases would run better! After the sessions it was time for formal and informal networking. There was the speakers meeting and the official welcome reception in the exhibit hall. I got to attend an official Oracle ACE dinner cruise on a steam powered paddle wheel river boat complete with live jazz band. Very much in the spirit of New Orleans. Stay tuned for more reports as the week progresses. P.S. 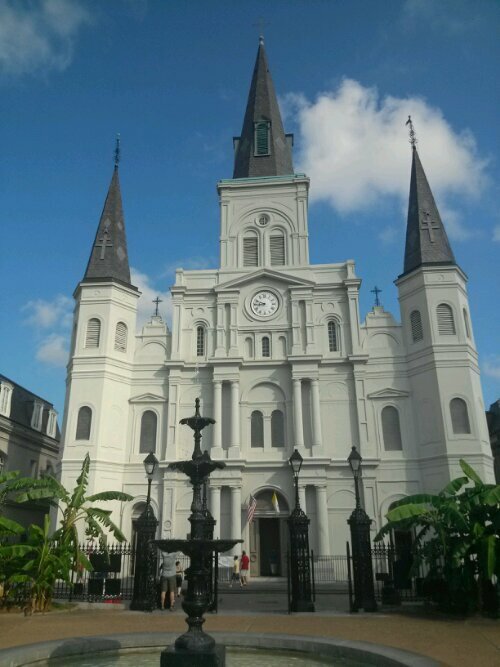 I got to do a little touring as well and visited the oldest Catholic Cathedral in the United States. It is quite a beautiful church inside and out.